SAI’s Wheel drives are either direct motor drive (P05R, P1G and P2G) which can be fitted with dynamic drum brakes, compact drive units (GK3, GK4 and TS8) which can be fitted with static brakes or separate Motor/Gearbox units incorporating wheel Drive Gearboxes (WR06B, WR10, WR20, G3 and G3A). 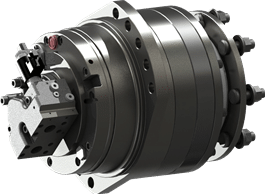 These high efficiency units offers great compactness and flexibitity and the compact wheel drives and gearboxes can be lubricated by the same hydraulic oil that lubricates the hydraulic motor crankcase. 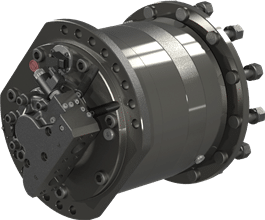 By fitting single, dual or variable motors to these drive units and gearboxes, wheel drives can therefore have fixed, dual or variable effective displacements (motor displacement x gearbox ratio). Wheel Drive Gearbox with reduction ratio 5:1. Static Braking Torque 3000 Nm. The WR6B can be fitted with 05 Fixed and 1 Series Fixed, Dual and Variable displacement Motors. They can be supplied for running with combined lubrication so that the hydraulic fluid also lubricates the gears. The brake used in the WR6B wheel drive unit is spring applied, hydraulic pressure released. Wheel Drive Gearbox with reduction ratio 4.8:1. Static Breaking Torque 7000 Nm. The WR10 can be fitted with 05 Fixed and 1 or 2 Series Fixed, Dual and Variable displacement Motors. They can be supplied for running with combined lubrication so that the hydraulic fluid also lubricates the gears. The brake used in the WR10 wheel drive unit is spring applied, hydraulic pressure released. Wheel Drive Gearbox with reduction ratio 6.6:1. Static Braking Torque 10000 Nm. The WR20 can be fitted with 1 or 2 Series Fixed, Dual and Variable displacement Motors. They can be supplied for running with combined lubrication so that the hydraulic fluid also lubricates the gears. The brake used in the WR20 wheel drive unit is spring applied, hydraulic pressure released. Wheel Drive Gearbox with reduction ratio 7:1. Static Braking Torque 6500 Nm. The G3 can be fitted with 05 Fixed or 1 Series Fixed, Dual and Variable displacement Motors. They can be supplied for running with combined lubrication so that the hydraulic fluid also lubricates the gears. The brake used in the G3 wheel drive unit is spring applied, hydraulic pressure released. The G3 can be supplied with or without the hub. Wheel Drive Gearbox with reduction ratio 5:1. Static Braking Torque 8750 Nm. The G3A can be fitted with 05 Fixed or 1 Series Fixed, Dual and Variable displacement Motors. They can be supplied for running with combined lubrication so that the hydraulic fluid also lubricates the gears. The brake used in the G3A wheel drive unit is spring applied, hydraulic pressure released. The G3A can be supplied with or without the hub. Compact Wheel Drive unit with Fixed, Dual or Variable 1 Series Motor components. Reduction ratio 7:1, Peak Output Torque 7000 Nm, Static Braking Torque 6500 Nm. Compact Wheel Drive units are supplied for running with combined lubrication so that the hydraulic fluid also lubricates the gears. The brake used in the K3 unit is spring applied, hydraulic pressure released. The K3 can be supplied with or without the hub. Compact Wheel Drive unit with Fixed, Dual or Variable 1 Series Motor components. Reduction ratio 5:1, Peak Output Torque 10000 Nm. Static Braking Torque 8200 Nm. Compact Wheel Drive units are supplied for running with combined lubrication so that the hydraulic fluid also lubricates the gears. The brake used in the K3A is spring applied, hydraulic pressure released. 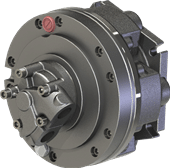 The K3A can be supplied with or without the hub. Compact Wheel Drive unit with Fixed, Dual or Variable 2 Series Motor components. Reduction ratio 5.6:1, Peak Output Torque 19000 Nm. Static Braking Torque 18000 Nm. Compact Wheel Drive units are supplied for running with combined lubrication so that the hydraulic fluid also lubricates the gears. The brake used in the K4 is spring applied, hydraulic pressure released. Compact Wheel Drive unit with Fixed, Dual or Variable 3.5 Series Motor components. Reduction ratio 6:1, Peak Output Torque 43000 Nm. Static Braking Torque 40000 Nm. Compact Wheel Drive units are supplied for running with combined lubrication so that the hydraulic fluid also lubricates the gears. The brake used in the TS8 is spring applied, hydraulic pressure released.